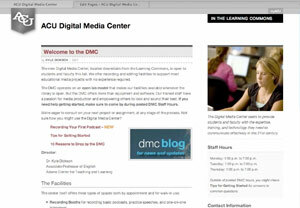 Several useful updates will be added to ACU Blogs over the break. Here are a couple video summaries to get you up and running with new plugins and features. If you’ve been looking for a simple way to add photos or graphics to your blog sidebar, this is it. *You’ll need to Activate the Image Widget plugin before beginning to use it. Last semester we added the PollDaddy plugin for blog polls. This semester they’ve added a 5-star rating feature for your posts and comments that works with our desktop theme and the mobile blog interface. *You’ll need to Activate the PollDaddy plugin and create a PollDaddy account at their website before beginning to use it. 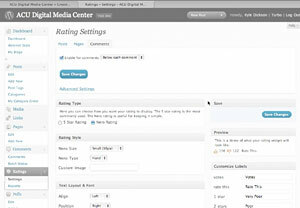 **PollDaddy Ratings require the ACU Blogs 1.5 theme. Finally, for advanced users, here is a plugin that gives you more control over how users keep up with new content on your blog using RSS readers. For a quick introduction to the idea of RSS readers, try RSS in Plain English by CommonCraft. 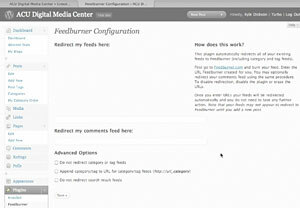 If you decide to try Feedburner, hereare instructions from WordPress as well as the Feed 101 page at Google. *You’ll need to Activate the Feedburner plugin before beginning to use it.